You can find answers to frequently asked questions here. If you wish to send an email, please use the contact form below. ▸ How much does it cost ? The cost of a Tandem Skydive is £330. The video option is an additional £130. Visit our booking page to select a date, and book online. You are required to pay a deposit of £130 at this time, or submit a gift voucher number. 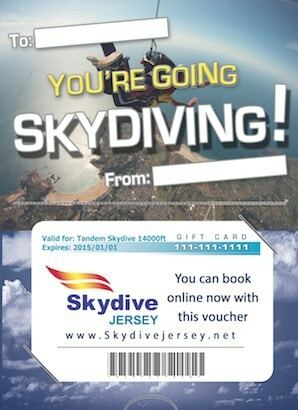 Skydive vouchers, video vouchers and cash vouchers are all available online. Can I film myself with a Go-Pro ? It is not safe or practical for you to attempt to film your own jump, therefore it is not permitted. Can you film my jump ? Tandem skydives can be filmed for a cost of £130 we produce 10 min. movie of your event and include still photographs, on a USB. Can I jump for charity ? You can find an information sheet on our downloads page. Where do you land ? Our designated landing area is at the Gunsite slipway, in St. Aubin’s Bay. Parachuting is constrained by weather, for reasons of safety. Wind speed must be less than 20 Knots, and if there is complete cloud cover below our operating level, jumping may be suspended. Parachutes still operate normally in wet weather, but for your own comfort this is avoided. What if my jump is cancelled ? We shall re-schedule you to the next available slot, you can be available. How high is the jump ? Your Tandem jump is made from up to 10,000 feet, equivalent to 2 miles high. This gives approximately 30 seconds of freefall time, before the parachute is deployed, then a further 5 minutes descending under the parachute. Can I skydive if disabled ? We have to assess each case individually, but subject to your condition, and a doctors certificate, it may be possible. Will the Parachute Work ? Modern parachute equipment is now extremely reliable, however In the unlikely event that the main parachute fails to operate correctly, all equipment is fitted with an emergency backup parachute, which can then be deployed. It should go without saying that making a parachute jump is not entirely without risk. However, the tight controls which are implemented to maintain safety at all BPA affiliated parachute centres, do so very effectively. You are required to sign an indemnity waiver, accepting the possible risks before you make your skydive. You are covered by BPA 3rd party insurance whilst making your parachute jump. This covers any damage you may potentially do, to any other person or property during your skydive. Skydive personal accident insurance is available online, from various companies, which can be found with an internet search & includes options for individual jumps, or annual cover. Do I need a medical ? 16 with parental consent. There is no upper age limit, subject to fitness. Yes. 95Kg, 210Lbs, or 15 stones. This is due to equipment limitations, your comfort and safety when landing. What is the BPA ? The BPA govern British sport parachuting, they ensure that parachute centres operate with rules and regulations, and maintain a high standard of safety. All British parachute association instructors have attended stringent courses to gain qualifications, and the necessary skills.